This is a magnificent building, inside and out. If you’re able to catch a performance there, we’re thrilled for you and a bit envious. If not, we highly recommend a taking a tour. The monumental proportions, sublime design and state of the art technology are testament to the high value Sultan Qaboos places on the arts. He’s a big fan of classical music himself but he had the opera house built for the people of Oman and visitors. Besides world-class performances, the opera house offers arts education programs, lectures and workshops. This is the ceremonial palace of the sultan of Oman. It’s not open to the public but it’s easily accessible for photos and visual consideration from the front and back. It’s a very unique piece of architecture, especially the central building, which I found kind of obnoxious initially, to be honest. But the more I look at it, the more I love it. It was completed in 1972, which explains a lot. The modern, organic Islamic style is whimsical and flamboyant in the most friendly way. I love it even more now than I did when I started writing this paragraph. Another awesome building, outside it’s all cool, serene elegance, with gleaming marble surfaces and pearly arches. Inside, the exposed timber ceilings are warm and earthy, while heavenly multitudes seem to open out to infinity in the massive central dome. Modestly dressed non-Muslims are welcome. 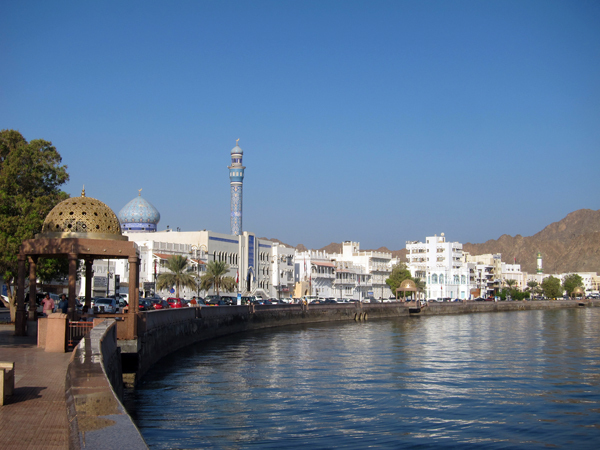 The Muttrah Corniche pedestrian promenade rambles for about 3km along the sea wall in the Muttrah district of Muscat. If you avoid the midday heat, it’s bustling with locals and visitors and is the perfect vantage from which to take in harbor sights on one side and the pretty sea-front avenue backed by the craggy Hajar mountains and old Portuguese watch towers on the other side. From the corniche you can access the fish market, best in the early morning, and the adjacent fruit and vegetable market and down the way is the Muttrah Souk. You’ll find benches, a park and fountains along the corniche. This, the oldest market in Oman, is a must, whether or not you’re a shopper. The streets closest to the corniche are pretty touristy but if you persevere into the maze you’ll find a feast of authentic shops. Some good buys are gold, silver and frankincense. Be sure to bargain. The souk closes from about 1-5pm each day and it especially bustles with locals in the evenings. Read more about Oman here. See more pictures of Oman here and here. See our tours to Oman here. This entry was posted in Arabian Peninsula, Oman and tagged al alam palace, hajar mountains, Muscat, muttrah corniche, muttrah souk, Oman, royal opera house of muscat, sultan qaboos, sultan qaboos grand mosque by yalla2013. Bookmark the permalink.